Well you know me, a real Type A. Hopefully I will eventually learn to take it easy and be on Mexican Time. Thats one of the benefits of living here and one of my goals. But in the meantime, I like to accomplish things, quickly and easily, just like I always did back home. I love seeing and learning about new things here in Colonial Mexico, and I hate driving, another reason Im here and my car is in L.A. I hate those big bus tours, doesnt everybody? Yet often an experienced guide and driver allows you to see and do more in less time. What got my attention last February was the sidewalk sign under the colonial arcade next to the Jardin: BUTTERFLIES. Curiosity made me climb the stairs to Tours Mexico Colonial, where Jaime, the handsome young Mexican owner of the company, was sitting behind his desk. Hola, Jaime! Whats with the sign about butterflies? Its freezing and the middle of winter. Si, si, thats why we have the Monarch Butterfly Tour, to see them in their winter home before their migration back north. We can only visit them from November to March. I had heard about the Monarchs resting in a particular tree the same time every year in Monterrey, California, but I hadnt ever seen them. OK, sign me up, I said. No matter where, I always loved Jaimes tours so personal, professional, informative and fun. Because it was a three hour drive to the 10,400 foot high alpine forest where the butterflies hibernate in the state of Michoacan, Jaime came by to pick me up at 7 Sunday morning. It was bucketing rain, a gigantic storm, and even at that early hour, the fireplace was burning high and I had almost set my slippers ablaze while sipping my coffee. When I hear the toot of Jaimes horn, I grab all the winter clothes I had brought with me (darn, left my parka in L.A.) and a mug of coffee for Jaime, and jump into the car. And so we zoom off in the deluge to the local trailer park to pick up a couple from Canada who had also reserved the butterfly tour. But when we get there, they come out in the pouring rain and say, Are you crazy? And so we postpone the trip. A few days later the morning dawns cold but bright, and so the four of us set off for the state of Michoacan. As we climb high in the Sierra Cinqua mountains, we pass through the old silver mining town of Angangeo, hung copiously with festive flags of laundry, since today is the first dry day in a long time. 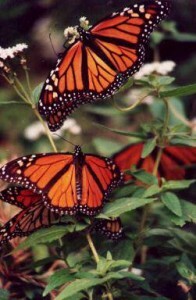 No one really knows exactly why the Monarchs come to this part of the world every year to hibernate, but some people think that the butterflies are drawn to Sierra Cinqua because of genetics, and others believe they come drawn by a kind of magnetism due to the minerals still in the earth there even after centuries of mining. Finally we arrive at the El Rosario Sanctuary, owned and operated by indigenous groups with the mandate to protect and preserve. The biggest problem facing the conservation of the winter home of the Monarchs here in Mexico is the prevention of clandestine logging and deforestation. Jaime pays to park in what I suppose is a parking lot, but today it is just our one car in a field of mud. As soon as we get out of the car and look around, just like in the old western movies, a posse of horses and riders crests the hill. Not needing to circle the wagons, these horses (and their owners) are for rent in case we dont feel up to the long trek to the Monarchs sanctuary way up in the pines. 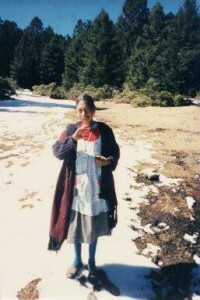 But instead, we set off on foot with our guide, Marie Elena Mondragon Chavez, a tiny indigenous woman of 68, who leads us up the hill, through the piney woods, and over the snow for hours. A guide is necessary because the butterflies refuge changes according to the sun and winds, and it takes a specialist to find them. The insects have their favorite trees and foods (milkweed) and are carried from area to area in the forests by warm thermals. 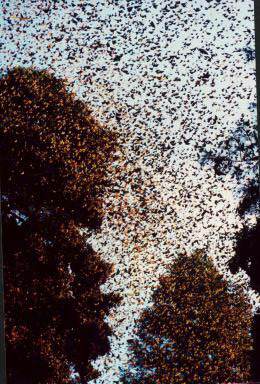 Long before we see a glint of their orange wings, we hear them, hundreds of millions of them. What appear to be acres of trees in brilliant autumn foliage is instead the multitudes of butterflies roosting so thickly as to entirely hide the trees. Because it is warm and sunny at that moment, they are beginning to move and fly and fill the air, thousands mating as they are mysteriously drawn here to do every year. But millions are dead in the snow at our feet, creating a sad frozen carpet of orange and black. Sundays storm three days ago had caused such extreme weather conditions of snow and cold and tree limbs breaking that havoc had been wrecked, only at that moment I dont know that. I only see the butterflies everywhere, surrounding me below and above me and filling the sky, and the world is a magical orange and black of movement. Guides are there to insure that visitors dont damage either the insects or any part of their haven. But our silence and awe and the quiet sound of millions and millions of wings beating turns the forest into a church, a holy mystic place of wonder, with tiny living fragments of stained glass which know something that we dont. Here was something no one really understands, a mystery taking place each year for millennia that even scientists cant figure out. In another couple of months, the Monarchs will begin their annual 3,000 mile return flight north to their summer homes in Canada and the United States. But for now they hang like clusters of Spanish moss from the fir trees high up in the mountains of Mexico, and then, when warmed by the sun, mate in the snow. The males die, the females live to lay the eggs in the milkweed that sustains the Monarchs, and the caterpillars hatch to begin the cycle again with the flight north. The ancient peoples of Mexico believed, and many still do, that each Monarch butterfly is the soul of a dead child, and the butterfly is also a common Christian symbol for the Resurrection. Theres no doubt that their yearly 6,000 mile roundtrip migration to the same forests in highest Mexico are a mysteryand a milagro. And the vaceros with the horses miraculously appear through the trees just as we, drained and weary, begin our descent. Jaime hikes down on foot with Maria Elena, but the Canadians and I mount our horses and set off through the snow, surrounded and serenaded by beating wings. Hi Cherie, I enjoyed just reading the Monarch Milagro. I too took on this adventure when I was living in San Miguel de Allende in 2004, and I too did it with Jaime who was definitely a fun factor for us. However it sounds like you hit the migration at its most active because at the time I was there, while the trees and ground were covered as you described, there was no noise of wings in the air as your article so intriguingly talks about. I remember on the way out, at the end of the day, we ate the bluest blue corn tortillas I have ever encountered in Mexico. Yes the Monarchs are a true wonder. I have also been fortunate to see them in transit — endless highways of butterflies streaming through the valleys in the state of Tamaulipas. If you were impressed with the Monarchs, another great wonder in Mexico to see is El Sotano de las Golandrinas (which translates the abyss of the swallows — swallows being the famous bird). Google this to see pics on the internet. It a huge hole in the earth at the top of a mountain in the state of San Luis Potosi, not far from Xixitla, out of which fly millions of swallows each dawn. It’s a wonder to see because the birds can’t fly straight up and out (because of the narrow dimensions of the abyss) and so they spiral up and out in the most picturesque way. You can look down upon them from above. At evening the whole same river of birds returns to swoop back down into their nests along the walls of the abyss. A definite, and unique, wonder of nature to put on your To Do List in Mexico. Sounds like you’re having an exciting life in Argentina now. Email me lunch if you like. It’d be fun to compare SMA/BsAs notes.